This guide offers descriptions and details on 27 official Hakata Akihaku 2018 events. Please check each event below for details. 9/1 (Sat.) ~ 11/30 (Fri.): Hakata Machiya Folk Museum – Explore Hakata in Kimono! The Fukuoka Freedom Night Market will take place on Fridays, Saturdays and Sundays from the beginning of August to the end of October. Located in Seiryu Park just beside Canal City, it’s easily accessible on foot from both Tenjin and Hakata. Browse a range of booths offering food and drink from popular Fukuoka and Kyushu restaurants, as well as booths offering accessories and handicrafts, massages, fortune telling, artwork, games, and more. New booths and live acts are rotated in every weekend! Whether you live in Fukuoka or are visiting from overseas, this annual summer outdoor night market is very entertaining. Free Wi-Fi available, too! • Every Fri., Sat. and Sun. Hakata Machiya Folk Museum – Explore Hakata in Kimono! The Hakata Machiya Folk Museum is located near Kushida Shrine. The facility gives visitors an idea of what life looked like in Hakata during the Meiji and Taisho eras. They also offer a kimono rental service, so that you can take a stroll through the local area while wearing traditional Japanese clothing. Staff will even help you get changed into the outfit! Be sure to make the most of the free guides as you explore some of the local shrines, including Kushida Shrine, Ryuguji Temple, and Tochoji Temple (Japanese only). Hakata ori themed UFO catchers (crane games) will be making an appearance at amusement arcades for a limited time! Give it a go and you could win a Hakata ori woven purse or pouch (¥200 per try). The mask used for Hakata Niwaka, a style of folk entertainment, features prominently in the designs. This exhibition celebrates Hakata ori, a textile that has been cultivated and perfected over a period of 777 years. Find out more about the history of this handicraft and the world of woven textiles through the noh play, “Kureha”. Works created by national living treasure Kisaburo Ogawa and Ogawa Zenzaburo will be out on display, alongside noh theater outfits made from Hakata ori. This popular museum and tourist attraction has a wide range of traditional handicrafts on display, including Hakata ningyo dolls. They also offer a hands-on experience for people to discover more about Fukuoka culture. Traditional crafts from Fukuoka and Hakata will be on display during the Akihaku period and various events and activities will take place too! Make sure to check out the handmade goods that will be on sale along with Hakata ori and Hakata dolls. On Sep. 29 the beautiful Jotenji-dori Ave. turns into a pedestrian paradise to celebrate the start of Akihaku. At the end of the avenue near Hakata Sennen-no-Mon, there will be four food and drink booths selling nihonshu (Japanese sake), kamaboko (fish paste) and Japanese handicrafts (chopsticks, sandals and more). 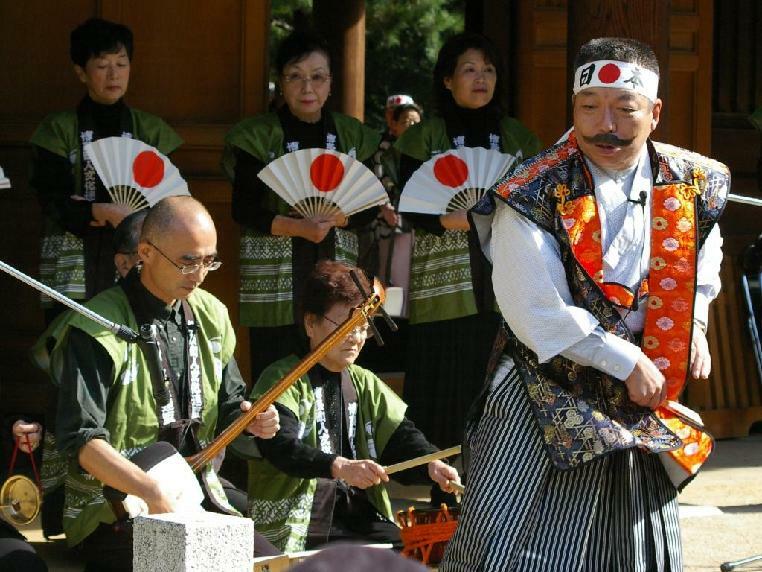 Events with the theme of wa (Japanese culture) will take place in Jotenji Temple such as tsugaru shamisen performance (11:00), ningyojoruri puppet show (12:00), traditional Japanese buyo dance with Chikuzen biwa lute (13:30) and gengakujuso string quartet performance (18:00). There will also be workshops on Hakata doll painting, magemono (wooden box) painting, pochibukuro (pouch) making, Hakata ori handweaving and more (reservations required). Huge noren (curtain) will be hanging from Hakata Sennen-no-Mon, making it the great spot for a memorable photo. Come in kimono for that picture-perfect Japanese shot! • Jotenji Temple, Jotenji-dori Ave. This festival will give children the chance to discover the delicious flavor of fish. A total of 11 restaurants from throughout the country will prepare a range of fresh, seasonal seafood dishes for diners to sample. Aside from the delicious food, there will also be enjoyable events for parents and children, including shrimp catching and catching fish by hand! There’s also a talk on how to inspect fish when buying. The packed schedule is aimed at all ages, so be sure to check it out! A full-scale noh theater production will take place outside Hakata Station, treating the public to this classic Japanese performing art. The first act will feature traditional hogaku music and a torch lighting ceremony while the second act will feature a production of the play Hagoromo taking place beside blazing torches. This style of open-air theater is known as takiginoh. The festival is said to have begun as a way of thanking the Sumiyoshi gods for the legendary Empress Jingu’s safe return from Korea by holding sumo and archery matches. Children wearing Heian-era clothes march in a parade, and intense, traditional Japanese archery while riding on horseback called yabusame will be held. Feel the excitement as elementary students battle it out to be the yokozuna (sumo grand champion) in the young men’s sumo tournament. Fukuoka City initially grew into the city that it is today from two towns: the merchant town of Hakata and the samurai town of Fukuoka. This guided tour will take participants around some of the most famous sites, providing insight into each history of the two distinctive sections of the city. There are four routes with different themes and destinations. Please be aware that the tours are only available in Japanese. Reservations recommended. Find out more about the local area with the Hakata Guides Association, a group known for the detailed information they provide. Explore some parts of the grounds that would not usually be accessible to the public. This is a great opportunity to view the inner sanctuary of Tochoji’s five-story pagoda and the Rokkakudo, which is located just in front of the main temple building (guides available in Japanese only). Oktoberfest is popular here too! This Bavarian festival returns with a huge beer tent, 12 varieties of German beer, performances by a Bavarian folk band and a great selection of German food, from sausages to pretzels. Enter the huge, circus-like tent by saying “Prost!” (Cheers!) and have a good time! Enjoy one of Hakata’s finest illuminations, as the area’s shrines and temples are lit in spectacular fashion by tens of thousands of lanterns, handmade by the local community. Discover art installations scattered in the area including Ohama Park, Former Gokusho Elem. School, Kushida Shrine and Hakata Elem. School. A free bus will run between attractions at Bayside Place Hakata and Tochoji Temple. Traditionally, tomyo lanterns are illuminated as votive offerings to the gods and Buddha, or at memorial services (供養). The Hakata Tomyo Watching festival started in 1994, inspired from a traditional ceremony called Sentomyo that is held at temples and shrines in Fukuoka and Oita in which 1,000 paper lanterns are lit up. The beautifully illuminated paper lanterns symbolize prayers for good health and the well-being of one’s family. Browse a wide range of imported goods and food from 20 different countries as this annual event returns to Fukuoka, bigger than ever! The approach to the Sumiyoshi Shrine will be lined with stalls selling homewares, accessories, clothes and more, run by popular local shops, a number of which are owned by local non-Japanese residents. As you wander the market, drop by some of the food and drink stalls and indulge in the ethnic cuisine on offer. This traditional festival, with 1,200 years of history, gives thanks to the gods for autumn’s harvest. An ox-drawn carriage pulls an ornate mikoshi (divine palanquin/portable shrine), while children wearing traditional kimono and tachi-eboshi (brimless headgear worn by court nobles) walk in a parade together with a marching band, starting at Kushida Shrine and weaving around the Hakata area. On Oct. 23 look forward to events including Gokokuhojo Market selling seasonal fish and vegetables (10:00~16:00), free amazake (10:00~16:00), Sentomyo (18:00~21:00) and honosumo ritual matches. A popular restaurant hopping event! Gokusho is an area teeming with historical shrines and temples, as well as older shops and restaurants. Have lunch, dinner, or even just snacks and drinks at a few places. Around 30 places to choose from – check out the ones you’ve never been to before, or visit old haunts. Watch as Nakasu becomes a pedestrian paradise, with wagons lining the streets to sell food and stages hosting amateur wrestling, karaoke contests, taiko drum performances and more. Don’t miss the Kunihiro Onna Mikoshi: a rare view of 500 women carrying a float around the streets (10/26: 19:25~, 10/27: 18:50~). Join a bar hopping event at three popular restaurants in Nakasu (10/25: 19:30) too. The Nakasu Halloween Night will be held at the same time, so join the fun and come in costume! Get in the Halloween spirit watching hundreds of participants wearing creepy and creative costumes in the annual parade from Hakata Riverain to Canal City. This is one of the biggest Halloween parades in Kyushu with 500 in attendance. All participants are awarded a small souvenir gift, and best dressers are awarded big prizes after the parade – first prize is ¥150,000! Want to join the parade and costume contest? Registration will be open from 9/28 (Fri.) to 10/20 (Sat.) on the official website, open to the first 500 registrants! Historic temples, shrines and gardens in the Hakata area will be beautifully illuminated in the colors traditionally used in Hakata-Ori Textile. It’s also an opportunity to enter locations not usually open to the public. Some of the sites become busy, so arrive early to avoid queues. You can enter up to ten sites with one ticket (valid for 5 days). During this period, viewing of Japan’s largest wooden statue of a seated Buddha is also open at night. This outdoor art event that will see cutting-edge contemporary art go on display at historic shrines, temples, and parks in the local area. A variety of installations created by domestic and international artists will be dotted around the city, turning the entire vicinity into an exciting art gallery. A huge human-shaped balloon, a video made using a shipping container, and a mermaid-themed painting will be on display. The pieces will be set up in locations close to where the Hakata Old Town Light Up Walk will be taking place. Enjoy contemporary art and gorgeous illuminations as you walk through the streets of Fukuoka at night! • Dekimachi Park, Reisen Park and other installations at: Ryuguji Temple, Hakata Machiya Folk Museum, Fukuoka Asian Art Museum, Hakataza, and more. Obi made from Hakata ori will be the main attraction in this special exhibition of local handicrafts. A selection of items featured will be on sale to the public. There will also be a reception accepting orders for tailor-made goods. Hakata ori manufacturers will be at the venue, meaning that visitors can get some expert advice before making a purchase. Sumo is the national sport of Japan and encompasses three core elements: mind (kokoro), spirit (ki), and body (karada). The sumo god of ki is enshrined and worshipped at Sumiyoshi Shrine. The yokozuna dohyo-iri dedication is an official ceremony in which a yokozuna (grand champion of sumo) enters the sumo ring. It is an official event held annually by the Japan Sumo Association before the Kyushu Basho. The event usually attracts more than 3,000 visitors and is free to all attendees. Official dohyo-iri events are held in only 5 locations in Japan. Take a stroll through the 400 m arcade of the Kawabata Shotengai at night and enjoy the retro atmosphere while browsing through approx. 40 open air stalls selling food, handicrafts and more in a bazaar-style market! On the night, some stores in the local area will also be offering discounts and perks to customers who have purchased special Hakata Old Town Light Up Walk tickets. The Hakata Machiya Folk Museum will be offering free admission during the Hakata Old Town Light Up Walk 2018, an event that sees local shrines and temples illuminated. Noh theater will be performed live inside the venue, which recreates what Hakata life looked like during the Meiji and Taisho eras. Visitors will be treated to performances of noh dance accompanied by various types of drums and flutes. Crowds gather at this annual, symbolic autumn event to watch the parade of women in traditional kimono. This year’s parade features a special course in celebration of the 777th anniversary of Hakata ori! Women clad in black kimono and Hakata kenjo obi (a traditional local craft) will walk in procession, accompanied by men with flags and lanterns. Hakata-Ori Textile is a local folk craft with 777 years of tradition. It has been popular for centuries for use in kimono and obi as a silk textile thanks to its tensility and thickness of the fabric. At the event, examples of Hakata-ori will be displayed inside Jotenji Temple, the birthplace of Hakata-ori. The location itself is a good reason to attend as it is usually closed to the public. Peruse the pieces on display and vote for your favorite. Enjoy the autumn foliage and optional outdoor tea ceremony (fee req.) in the Japanese karesansui (rock) garden. Come in kimono to receive complimentary presents! Hakata-born Otojiro Kawakami was known for penning the popular, Meiji-era satirical song “Oppekepe-bushi”. Having toured the world twice with his own group as the first Japanese theater troupe to perform in the West, Kawakami was also the first person to likewise introduce Western plays like Shakespeare to the Japanese audience. A Buddhist memorial service in his honor is held every year on his death anniversary, Nov. 11, by a Buddhist monk at the Jotenji Temple. Find out more about Otojiro Kawakami here. This guide is constantly being updated with more Akihaku events. Check back for more events! NOTE: The information presented here was gathered and summarized by the Fukuoka Now staff. While we have done our best to check for accuracy, there might be errors and details may have changed. If you notice any errors or changes, please contact us. This report was originally written in Oct. 5, 2015.